In 1972, the family behind the legacy known today as Shoes 'N' More began its long and respected journey in the shoe business. Shoes 'N' More stepped into style with a simple yet effective mission: to provide the perfect shoe for every occasion. In 1997, Shoes 'N' More opened it's first Connecticut store at 251 Greenwich Avenue. Soon thereafter, the store became a regular fixture and the striped awnings became a beacon...an infinite abyss of shoes provided by a family with years of experience in the business. The store also offered the promise of quality, stylish wardrobe staples, and a haven to every shopper strolling the avenue. For the past 45 years, Shoes 'N' More proudly stands strong and has expanded its striped awnings throughout Fairfield & Westchester County. Today, Shoes 'N' More has locations in Greenwich, New Canaan, Westport, Rye, &; Bronxville. Even with five fabulous locations, it became clear that there was so much more to offer! So it was decided to take the " 'N' More" and run with it-- landing on Elm Street in New Canaan. Shoes 'N' More (121 Elm Street.) 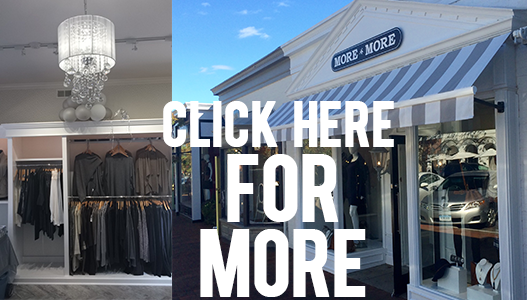 More 'N' More takes the next step in style... providing our customers with a dream closet with the latest and most fabulous accessories and clothing to both women & girls alike. ...because more is never enough! Shoes 'N' More Inc, 2015. Powered by Blogger.